Perhaps the only thing more torturous than trekking 600 miles to the South Pole, through some of the most inhospitable conditions nature has to offer, is watching your son do the same. And that's precisely what explorer Robert Swan experienced this winter, when he and his son, Barney, undertook a record-setting journey to the South Pole, becoming the first explorers ever to do so surviving solely off of renewable energy. "At the age of 61, it's not really something that people should do," Robert Swan told the GlobalGoalscast of his decision to undertake the grueling journey across Antarctica. It was his second trek to the pole, 32 years after his first. "But Barney convinced me that together as father and son, together as the millennial generation and the older generation, we need to join together because this can't be a bunch of young people thinking one thing and a bunch of old people thinking another. We've got to join together because we are in a survival situation on planet Earth." Their goal was to show that if they could manage such an incredible feat while counterbalancing their emissions, then the rest of us should be able to make small climate-conscious adjustments in our own lives, as well. This required the pioneering of new equipment that would use renewable energy to melt snow and ice into hot water on the move in the Antarctic. It also required Robert Swan, who 32 years ago became the first man to walk to both poles, to come out of retirement in a very big way. "Dad is 61. He's not 40. He's not 50," Barney told Claudia Romo Edelman and Edie Lush of the GlobalGoalscast upon his return from the Antarctic. "And once we were out there for three weeks, even two weeks, I really began to see a degree of suffering that I've never seen in my father before. He is from a generation that is built of steel, and he himself is built of concrete, and I saw him go to places that I wouldn't wish people to go to." Their 600-mile trek was projected to take 60 days, based on the assumption that the father and son could log an average of 10 miles a day. However, after a few weeks, they fell behind those projections and had to make up time to ultimately reach their goal. At this new, faster pace, Robert struggled to keep up. And while the others got the daily opportunity to recover at camp before their next excursion deeper into the Antarctic, the elder Swan found himself with less and less recovery time -- a reality which began taking a toll on his body. "His legs, his inner thigh, everywhere in between, it was like repellant," Barney recalled. "We're talking like bits of flesh falling off him. He was decaying. And to think that all it takes is that one degree too far and you could die; I was literally watching my father on the slow road to death." Robert soon realized that in order for the expedition to succeed he would have to bow out. So he made arrangements for a helicopter to transport him back to base camp, and he made the excruciating decision to leave Barney behind. "It was the worst moment of my life for the simple reason that I knew what lay ahead," Robert recalled through tears in an interview at Davos. "I felt a failure as an expedition leader. I felt a failure for my son. I felt absolutely appalling, but I knew that this expedition wasn't about Robert Swan. This expedition was about inspiring people on energy use. It was about doing the right thing and the right thing for me to do was to put myself second and the expedition first. I just had to, for once in my life, realize my limitations. And I went back to the base camp and had the worst week of my life, dealing with the word failure. And I had to listen to what was happening with my son's feet. His toes were turning black... And I was sitting there thinking, 'I should be there.'" "I don't think I've ever been as proud of my dad," an emotional Barney says in the upcoming CBSN Originals documentary, "Expedition Antarctica." "It takes courage to tell your team you don't have it in you, and that's what he did today." 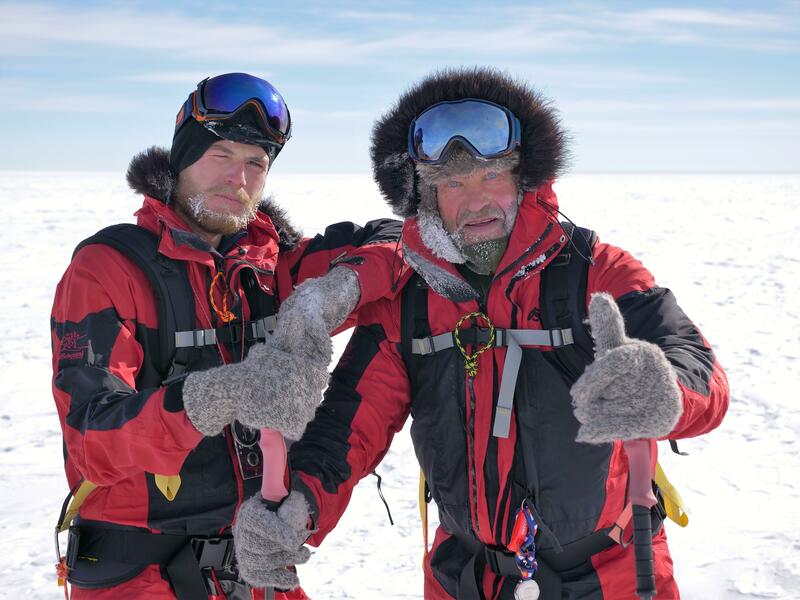 Barney, more determined than ever, continued toward the south geographic pole. And when he was 60 miles from the goal, Robert choppered back in to join him, so that together, they could complete what they started. His son was, of course, a little worse for the wear. But he had made it. "I put my arms around him and it just seemed to keep going on forever because he'd become so thin and that was hard, but he was there. And I was back in a silly way to look after him. And I was so proud because we were going to make it. And everything that we were doing -- the renewable energy, the biofuels -- everything was working." Now back home, father and son view the moment of that reunion not as the end of a story, but the beginning of a crucial environmental journey. "Thirty-two years ago, we'd staggered in. I had lost 69 pounds in 70 days and was in pretty bad shape. Thirty-two years on, we arrived together to start something because, as we all know, you need a story to get people's attention," Robert explained on the GlobalGoalscast. "We want it simply to mean that if we've made the effort to do what we've done, then other people could make some small efforts themselves."